The change of direction of light because of change of medium is known as Refraction or Refraction of Light. The ray of light changes its direction or phenomenon of refraction takes place because of difference in speed in different media. The light travels at faster speed in rare medium and at slower speed in denser medium. The nature of media is taken as relative. For example air is a rarer medium than water or glass. When ray of light enters from a rarer medium into a denser medium, it bends towards normal at the point of incidence. On the contrary, when ray of light enters into a rarer medium from a denser medium it bends away from the normal. Ray emerging after the denser medium goes in the same direction and parallel to the incident ray. The angle between incident ray and normal is called Angle of Incidence and it is denoted as ‘i’. The angle between refracted ray and normal is called the Angle of Refraction. 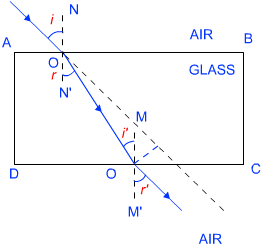 Angle of refraction is denoted by ‘r’. The incident ray, refracted ray and normal to the interface of given two transparent media, all lie in same plane. The ratio of sine of angle of incidence and sine of angle of refraction is always constant for the light of given colour and for the pair of given media. The Second Law of Refraction is also known as Snell’s Law of Refraction. The constant is called refractive index of the second medium in relation to the first medium. A ray of light changes its direction when it enters from one medium to another medium. This happens because speed of light is different in different media. For example; the speed of light is 3 x 108 m/s (2.99x108 m/s) in vacuum and it is 2.98 x 108 m/s in air. Refractive Index is the extent of change of direction of light in a given pair of media. The refractive index is a relative value of speed of light in the given pair of media. Thus, to calculate the refractive Index the speed of light in two media is taken. Above expression gives the refractive index of medium 2 with respect to medium 1. This is generally denoted by n21. Similarly, the refractive index of medium 1 with respect to medium 2 is denoted by n12. Absolute Refractive Index:When one medium is taken as vacuum and speed of light is taken in it, then the refractive index of second medium with respect to vacuum is called Absolute Refractive Index and it is generally denoted by n2. Since, Refractive Index is the relative value of the speed of light of a medium with respect to the speed of light in vacuum, thus light will travel faster in the medium having lower value of refractive index. Optical Density: Medium having greater value of refractive index is called optically denser medium, this means light will travel at slower speed in optically denser medium compared to in an optically rarer medium.